Heat shock proteins of the 40-kDa type (Hsp40) provide protection from proteotoxic stress by repairing stress-damaged proteins and suppressing protein aggregation [1-4], implying that this disruption of proteostasis has both functional and clinical relevance [5,6]. DnaJ proteins are co-chaperones of the DnaK/Hsp70, with whom they carry out their co-chaperone function in facilitating the correct folding of client proteins [7,8]. Published reports have suggested that DnaJs are the primary mediators of this binding to client proteins, presenting them to DnaK/Hsp70 afterwards [9,10], although some exhibit self-chaperone activity . The extensive diversity of architectural domains and subcellular localizations in DnaJs reveals the presence of a J-domain signature that is important for stimulating ATPase activity  and for binding DnaK/Hsp70. Details of the functionality of specific J protein remains elusive, even though sequence analysis has highlighted the diversity of the J protein family . The Hsp40 family is a large group of proteins, classified on the basis of molecular weight (~ 40 kDa), with structural and functional diversity , yielding 3 subtypes (types I, II, and III), whose sub-classifications are based on the degree of domain conservation, when compared to those of Escherichia coli DnaJ . The J domain at the N-terminus of type I is a disordered glycine-phenylalanine (G/F)-rich region, possibly serving as a linker between the J-domain and the C-terminal region of DnaJ proteins, 2 zinc-finger-like motifs, and a conserved carboxyl-terminal domain (CTD) . Type II Hsp40s on the other hand, lack the zinc-finger-like motifs while only conserved J domains are found in type III Hsp40s. Interactions between Hsp40 and Hsp40-like proteins with their co-chaperone (Hsp70s) are believed to be mediated by J domain as the major binding site . The J domain architecture includes 4 α-helices (helices I-IV), with a loop region containing a highly conserved tripeptide of histidine, proline, and aspartic acid (HPD motif) located between helices II and III . Studies of binding inhibition using peptides suggest that the J domain in yeast Hsp40 called Ydj1 has minimal Hsp70-binding site between amino acids 2 and 35, which includes helices I and II, and the HPD motif , allowing the HPD motif to help alter the orientation of the charged residues in helix II to produce correct interaction of helix II with the ATPase domain of a partner Hsp70 [18,19]. Additionally, type I and II Hsp40 protein contain a C-terminal peptide binding fragment which recognizes and bind hydrophobic side chains of denatured polypeptides , transferring non-native polypeptides to the Hsp70 peptide-binding domain in the process. The critical roles of the N and the C-terminus region of the DnaJ proteins in chaperone function, alongside their partner Hsp70s suggest that mutations in these regions could directly or indirectly abrogate chaperoning functions, with attendant consequences for disease-associated protein misfolding and unmitigated cellular stress. To test this hypothesis, we sequenced the N- and C-terminal regions of the bovine DNAJA1 heat shock protein gene in 15 cattle breeds from Asia, Africa and North America and compared to yak to better understand genetic diversity in the bovine DNAJA1 gene in Bovidae. Our goal is to elucidate the underlying molecular footprints in the DNAJA1 gene that may be characteristic of evolutionary and functional differences in geographically separated breeds of cattle. Total of 86 blood samples from 15 geographically separated cattle breeds and yak were collected from Africa (Nigeria), Asia (Pakistan) and United States of America. They were made up of Pakistani breeds: Achai (n = 5), Cholistani (n = 5), Bhagnari (n = 5), Dajal (n = 7), Dhanni (n = 7), Lohani (n = 5), Narimaster (n = 5), Red Sindhi (n = 5), Sahiwal (n = 5), Therporter (n = 5) and yak (n = 4); American breed: Brangus (n = 7); Nigerian breeds: Muturu (n = 6), N'dama (n = 5), Sokoto Gudali (n = 5), and White Fulani (n = 4). About 3 ml of blood collected from each animal was processed for genomic DNA isolation, yield and quality, as previously described . Two primer pairs (F: 5'-GTTGAAAGTCGGTTAAAATTGAGC-3' and R: 5'-TCATGAAGCCGTGTATACTCCC-3') and (F: 5'-GGAAGAAAGGGCATCTTTTGAAAT-3' and R: 5'-TTGGCACTTCTGGCAATTCAG-3') were designed using NM_001015637.1 as reference sequence to amplify 619 bp spanning exon 2, introns 2 and 3 in the N-terminal domain and 523 bp spanning exon 7, intron 7 and exon 8 in the C-terminal region of the cattle DNAJA1 gene respectively. PCR amplifications were carried out in a total reaction volume of 20µl containing approximately 50ng DNA, as previously described (Adefenwa et al. 2013) and the following cycling conditions: denaturation at 95oC for 4 min, followed by 35 cycles of denaturation at 94oC for 30 s, annealing at 53oC (for N-terminal region) and 54oC (for C-terminal region) for 30 s, extension at 72oC for 1 min, and extended elongation at 72oC for 10 min. 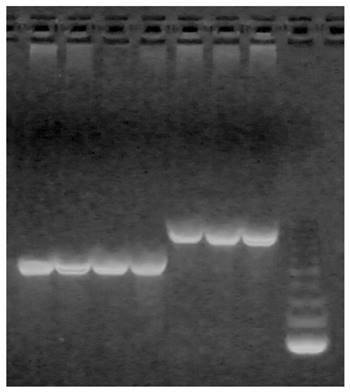 Agarose gel electrophoresis was used to detect amplified products on a 1.5% ethidium bromide-stained gel, and band sizes scored with a GENEMate Quanti-Marker 100 bp DNA ladder (BioExpress, Kaysville, UT, USA). Amplified PCR amplicons were purified with the Zymo DNA Clean and ConcentratorTM kit (Zymo Research Corp., Irvine, CA, USA) and sequenced at the Cornell University Genomics Core Facility. Sequence bases were called and assembled, as previously described , while single nucleotide polymorphisms (SNPs) were identified with Codoncode Aligner 3.7.1 software (http://www.codoncode.com/aligner) and DnaSP version 5.10.01 . Using NCBI accession number NM_001015637.1 as reference, we detected SNPs, as described previously , utilizing the nomenclature for sequence variation (http://www.hgvs.org/mutnomen). Genotypes were obtained from analyzing and comparing electropherograms. To calculate index of sequence variation, haplotype structure, including numbers of polymorphic sites and haplotypes, DnaSP software version 5.10.01 , while PANTHER  was used to to assess in-silico functional analysis of missense mutations while alignment of the nucleotide sequences was done using ClustalX . 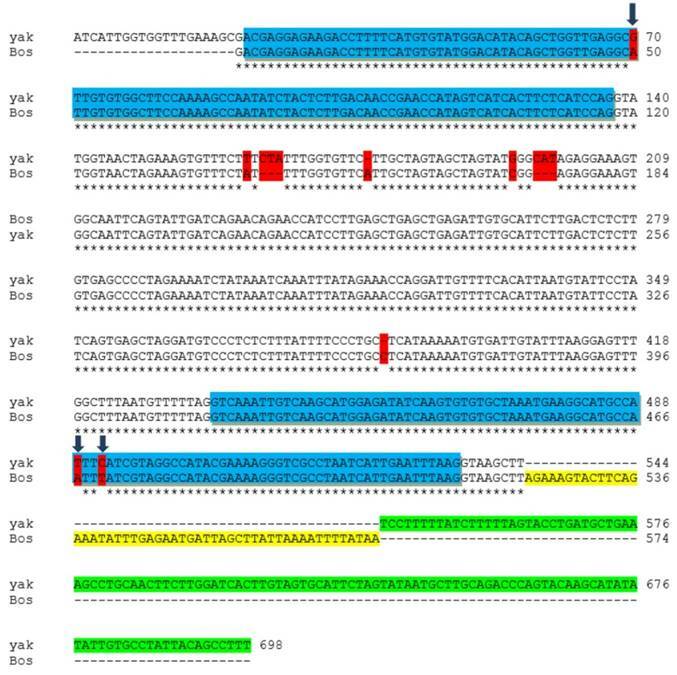 Two primer pairs were designed to amplify 619 bp in the N-terminal region spanning exon 2, introns 2 and 3 and of 523 and 717 base pairs in the C-terminal regions of domestic cattle and yak respectively) spanning exon 7, intron 7 and exon 8 of the bovine DNAJA1 gene (Figure 1). BlastN analysis predicted 99% similarity between the N-terminal region and the reference sequence (NM_001015637.1). Sequence alignment of the N-terminal region using ClustalW identified 5 polymorphic sites in Asian and African breeds and two polymorphic loci in American breed (Brangus). The two polymorphic sites identified in Brangus were also identified in both African and Asian breeds. Interestingly, all the SNPs identified in this study occurred in exons 2 and 3, followed by the presence of invariant sites in intron 2. The C-terminal region appears to be largely conserved among African, Asian and American breeds of cattle as well as in yak. However, there were a few notable differences between the consensus cattle and yak sequences with respect to the C-terminal region (Figure 2). Alignment of the consensus sequences of yak and domestic cattle identified the following SNPs: c. 914A>G in exon 7; c. 1035A>T and c.1038T>C in exon 8 of yak DNAJA1 gene using NM_001015637.1 as reference (Figure 3). Although c.914A>G synonymous mutation resulted into p. C271 silent mutation, c.1035 A>T and c. 1038 T>C non-synonymous mutation resulted in p. I310F (amino acid change from isoleucine to phenylalanine at position 310) and p. Y311H (amino acid change from tyrosine to histidine at position 311) missense mutation respectively. Notably, a 124 bp insertion in intron 8 was observed in yak but absent in the cattle DNAJA1 gene, and was also not found in the bovine genome database (Figure 2). Identified SNPs includes 3 non-synonymous ones (c. 57A>C; p. Q19H, c.58 G>C, p. E20Q; c.161 T>A, p. V54Q), a nonsense mutation (c. 61 G>T, p. E21X) and a silent mutation (c.162 G>A, p. V54). In the American breed, only missense mutation (c.58 G>C, p. E20Q) and silent mutation (c.162 G>A, p. V54) occurred in exon 2 and exon 3 respectively. Alignment of the amplified N terminal coding region with 1hdj (NMR solution structure of the human hsp40 (hdj-1) J domain) suggested that these p. Q19H, p. E20Q and p. E21X amino acid changes occurred in helix 2 while p. V54Q occurred in helix 3 of the J domain. The 3 missense mutations observed in the N terminal, J domain include: (1) c. 57A>C, resulting in an amino acid change from glutamine to histidine; (2) c.58 G>C, resulting in an amino acid change from glutamic acid to glutamine; (3) c.161 T>A resulting in an amino acid change from valine to glutamine. At position 19, glutamine was observed to be conserved in human, cattle, dog, and mouse but was replaced by arginine in chickens. Although amino acid positions 20, 21 and 54 appears to be conserved in cattle, dog, human, mouse and chicken (Figure 3), mutations at these positions observed in this study could plausibly have functional consequences. Upper band corresponds to 717 bp region observed in Yak; lower band corresponds to 523 bp region of the C-terminal region of domestic cattle, corresponding to peptide binding domain in cattle species. SNP positions on the aligned DNAJA1 N- terminal J domain region in cattle aligned with human (NP_001015637.1), mouse (NP_001530.1), dog (NP_001158143.1) and chicken (NP_001239072.1.) sequences. In-silico functional analysis using PANTHER predicted a moderately high subPSEC (-2.71504) and Pdeleterious (0.42924) values for c. 57A>C non-synonymous mutation and a much higher subPSEC (-5.83501) and Pdeleterious (0.94454) values for c. 161T>A non-synonymous mutation. Although amino acid changes p. Q19H occurred in helix 2 and p. V54Q in helix 3, putative functional impacts on the protein were much more pronounced in p. V54Q. These putative deleterious amino acid changes (p. Q19H in helix 2 and p. V54Q in helix 3) were only observed in African and Asian cattle breeds but absent in American breeds. As for the amino acid changes observed in yak with respect to the C-terminal region, the amino acid altering mutations were predicted by PANTHER to be non- deleterious, given the Pdeleterious and subPSEC values (0.44, -2.77 and 0.414, -2.65) for p. I310F and p. Y311H amino acid changes respectively . Eleven, 9 and 2 haplotypes identified in Asian (from Pakistan), African (from Nigeria) and American cattle breeds are shown in Tables 1, 2, 3 along with haplotype frequencies. Among Asian breeds, 43.1% of the breeds belonged to haplotype 1 (AGGTG) while the remaining individuals belonged to other haplotypes (Table 1). Surprisingly, while most of the Asian breeds belong to haplotype 1 including yak, Bhagnari breed, a draft type breed with compact and well-proportioned body and limbs lacked haplotype 1. Among African breeds, 40% of individuals belonged to haplotype 1 (AGGTG) (Table 2) while others belonged to other haplotypes. Approximately 85% of American breed (Brangus) belonged to haplotype 1 (Table 3), suggesting this haplotype may be the ancestral haplotype at this locus, for all breeds. Hsp40 is known to possess functional domains that play crucial roles in chaperoning non-native proteins, and consists of a conserved J domain that enables Hsp70 to perform its essential cellular functions [26,27]. The expression of DNAJA1, a homolog of Escherichia coli DnaJ, has been implicated in meat tenderness . Our BlastN analysis of the amplified N-terminal J domain and the C-terminal regions of the DNAJA1 gene showed 99% and 100% similarity (except for yak C- terminal region) respectively to the bovine DNAJA1 gene with accession number NM_001015637.1. Five polymorphic loci located in exons 2 and 3 were identified in the N-terminal region (containing the J domain), while intron 2 remained conserved among cattle breeds. Conservation of intron 2 observed in our study, as published , may be indicative of its transcriptional role in DNAJA1 gene expression and splicing. Five polymorphic loci were observed in the N-terminal J domain with the first three mutations (c. 57A>C, c.58 G>C, c. 61 G>T) occurring within 5 bp region in exon 2 while the remaining two mutations (c.161 T>A, c.162 G>A) occurred within 2 bp in exon 3, and these were only observed in Asian and African breeds. Interestingly, the number of mutations observed in American Brangus raised in temperate environment is somewhat different from cattle raised in tropical environments. Although the observed genetic differences might be concomitant with breed population history, whether the mutations are environmentally-induced to plausibly improve the functional activity of DNAJA1 gene in these cattle breeds remain obscure and are subject to further investigation. The conserved nature of the amplified C-terminal region among domestic cattle and yak irrespective of their geographical differences might suggest a critical role in binding non-native client proteins to avoid deleterious effects of mutations in this region . C-terminal region in DnaJ proteins has been reported to be functionally involved in binding of client proteins  and in dimerization and chaperone activity . Also, the C-terminal region possess two-barrel topology domains: the C-terminal domain I (CTD I) and CTD II, in which CTD I has a hydrophobic pocket that is thought to bind client proteins, while the extreme C terminus (CTD II) increases affinity for client proteins through a dimerization domain . The alignment of the consensus sequence of the carboxylic region in domestic cattle and yak showed some subtle variation within DNAJA1 gene and the exonic mutations included c. 914A>G in exon 7, c. 1035A>T and c.1038T>C in exon 8 as well as mutations in the introns. Deletions and substitutions observed in intron 7 and a 124 bp insertion in intron 8 of the C-terminal region may reflect considerable evolutionary divergence between domestic cattle and yak dating up to 5 Mya [32,33]. Whether the 124 bp insertion observed in yak DNAJA1 contributes to the stability of DNAJA1 gene in the yak genome is unknown now, and the functional or structural relevance of this insertion deserves further investigation. Eleven and 9 haplotypes were identified in Asian and African breeds of cattle with American Brangus (indicine Brahman x taurine Angus) population having two haplotypes. The disparity between the tropical breeds and temperate breeds of cattle with respect to the number of haplotypes could be explained in part by sample size. While it was surprising that c.58 G>C in exon 2 and c.162 G>A in exon 3 were only observed in American Brangus compared to the five polymorphic loci observed in this study in tropical Asian and African breeds, it may support the hypothesis that these genetic differences may have been sculpted by evolutionary forces to improve functional capability in both tropical and temperate environments. DNAJA1 possesses the same structural features that are found in E. coli DnaJ . These features include a J domain, a 70-amino acid sequence of 4 helices and a loop region linking helices II and III with a HPD motif , a glycine-phenylalanine (G/F)-rich region, 2 zinc-finger-like motifs, and a conserved carboxyl-terminal domain (CTD). In this study, mutations were observed in positions 19, 20 and 21, which were earlier predicted to be part of the amino acids found in helix 2. In-silico functional analysis of these SNP positions suggested no deleterious effects of these mutations based on their Pdeleterious and their subPSEC values. The reasons for the non-deleterious effects of these mutations could be due to the important functional roles played by helix 2 in Hsp70 ATPase activity. Genetic studies have proposed that several DnaK mutations exists, thereby suppressing the effects of mutations in the critical HPD motif of DnaJ . Whether effects of mutations in the helix region of the J domain are suppressed by mutations in DnaK is unclear, but a published report  observed that substitution of certain key residues in helix 2 disrupts J domain-based interactions with Hsp70. In-silico functional analysis of the missense p. V54Q mutation predicted much higher deleterious effects with a likely functional consequence. To this end, we recommend additional experiments involving site-directed mutagenic studies to evaluate the effects of these mutations on their chaperoning functions, to verify present speculations. Differences in the C-terminal region SNPs between yak and domestic cattle may be due to speciation effects. The missense mutations (p. I310F and p. Y311H) observed in yak was predicted by PANTHER to be non-deleterious, further supporting our previous assertion that evolutionary avoidance of mutations in this region is imperative for the functional role of binding to client proteins. The results from our study underscore the need for more work in this area since our analysis focused on the sequences of the N-terminal and C-terminal regions while taking cognizance of the important roles played by other regions (G/F and the zinc-finger domains) in chaperoning functions. Complete genomic analysis of the entire DNAJA1 sequence and the analysis of functional effects of DNAJA1 polymorphisms on prevention of protein misfolding, heat tolerance and meat tenderness are areas ripe for future investigations. These will enable us gain better understanding of the functional consequences of DNAJA1 gene variants on economically important traits in cattle and other livestock species. In conclusion, differences in DNAJA1 (Hsp40) gene exists between tropical and temperate cattle from Africa, Asia and America, but the number of mutations observed in American Brangus raised in temperate environment was different from cattle raised in tropical environments. These differences may have been sculpted by evolutionary forces during adaptation of these cattle breeds. The conservation of the carboxylic terminal region in domestic cattle and yak suggest its critical role in binding non-native proteins. However, the 124 bp insertion observed in yak may have functional or structural roles that are yet unknown. Taken together, our results support significant diversity at this locus that may have functional impact on climate adaptation in animals. We are grateful for the financial support from the College of Agriculture and Life Sciences, Cornell University, Ithaca, NY and Zoetis, Inc. Additional support by National Research Initiative Competitive Grant Program (Grant No. 2006-35205-16864) from the USDA National Institute of Food and Agriculture, USDA-NIFA Research Agreements (Nos. 2009-65205-05635, 2010-34444-20729) and USDA Federal formula Hatch funds appropriated to the Cornell University Agricultural Experiment Station are gratefully acknowledged. OOA was supported by a 1278468 fellowship from the US Agency for International Development; BNT is supported by a Laboratory Support and Faculty Development Award, College of Health Sciences and Technology, Rochester Institute of Technology. Visiting fellowships awarded to TH and WAK by the Higher Education Commission of Pakistan are also gratefully acknowledged. OOA, MDD, IGI and BNT conceived the project; OOA, SOP, MDD and IGI designed and performed the experiments; OOA, SOP, MDD, IGI, BNT analyzed the data; OOA, IGI, BNT wrote the manuscript; FDM, WAK, TH, MEB contributed to the scientific content. All authors read and approved the final manuscript. Corresponding authors: Dr. Bolaji N. Thomas, Department of Biomedical Sciences, Rochester Institute of Technology, Rochester NY, 14623. USA; Tel: +1 585-475-6382; E-mail: bntsbiedu. Dr. Ikhide G. Imumorin, School of Biological Sciences, Georgia Institute of Technology, Atlanta, GA 30332. USA; Tel: +1 404-894-3747; E-mail: igi2gatech.edu.